As a busy Professional Parent, I love finding recipes that are quick, easy and preferably nutritious…though I will go for quick, easy and decedent at times too! The only recipes you will ever find on this blog are ones that are super easy family recipes. 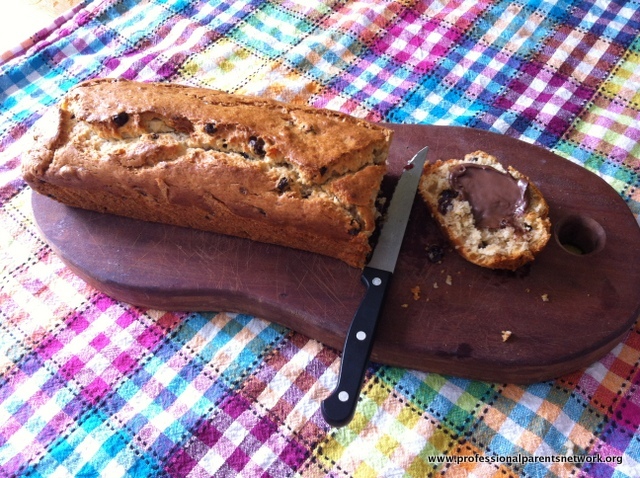 Here’s one of my favourites….a delicious banana bread. I first found it in the 4 ingredients Kids book and have made a few of my own adaptations. Gather all the ingredients first – as I’ve been caught out half way through cooking something before and am missing something crucial! Preheat the oven to 180 degrees celsius and line a loaf tin with baking paper. While you’re doing this, you can get the kids to mash the two bananas in the bowl. 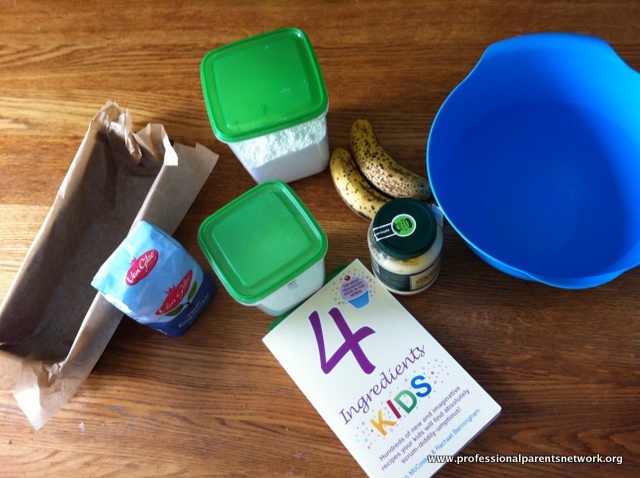 Great use for those over-ripe bananas they won’t eat – but are quite happy to mash and then eat in the banana bread! 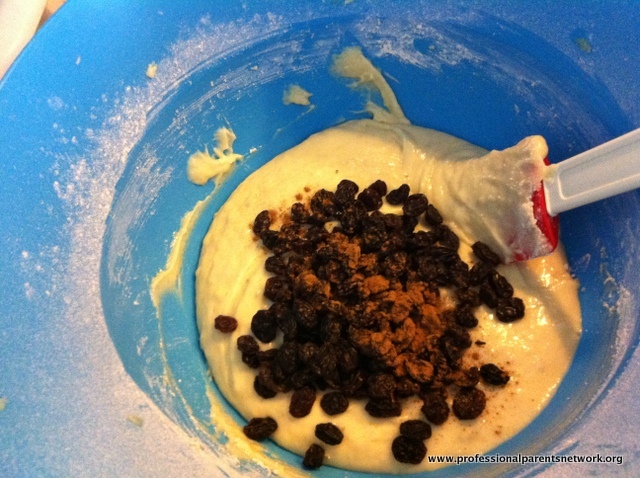 Mix in the sugar – I’ve also tried this with brown sugar and raw sugar which both seem to work fine as well. Got to love a recipe you can substitute things and it still works! 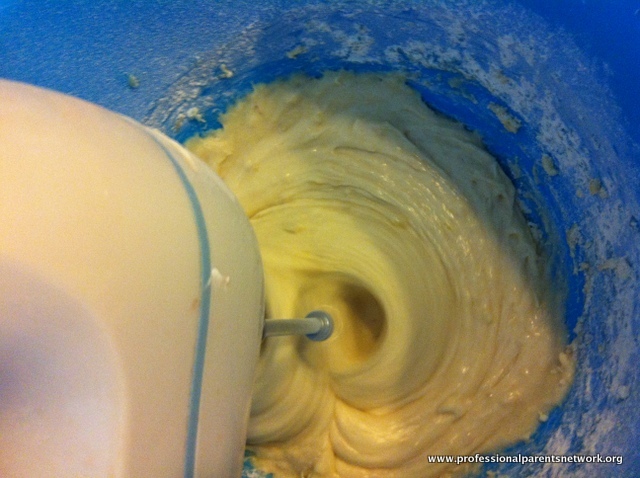 Next, mix in the mayonnaise and flour. The original recipe says to sift the flour which may make it ever better – but I haven’t sifted flour since before I had kids!! You? Does it really make much difference? A pinch of salt is also suggested but I rarely add salt to my cooking. Depending on the size of the bananas, you may need to add a little more flour or mayonnaise to get a smooth batter. You can pour that straight into the tin, or I’ve experimented with adding various extras such as sultanas & cinnamon. Chocolate chips are good too. Bake it for around 45 minutes, or until a knife stuck in the middle comes out clean. Cool for about 15 minutes in the tin (if you can wait that long!) and then let cool on a wire rack. We love eating it warm with a good slathering of butter or Nutella. Take a look at the 4 ingredients YouTube Channel for lots more easy ideas. 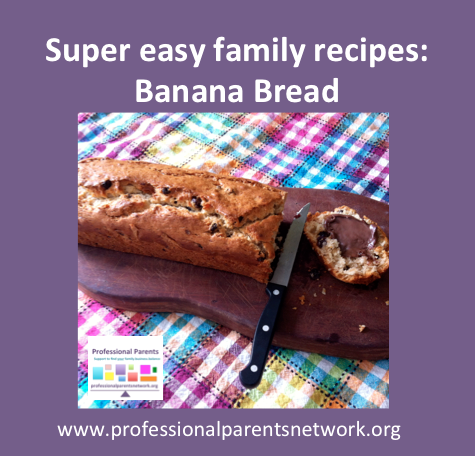 I’ll also continue to feature a series of super easy family recipes here on the Professional Parents blog.